The PCC is an independent self-regulatory body which deals with complaints about the editorial content of newspapers and magazines (and their websites). 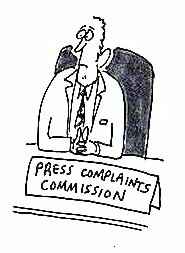 The Press Complaints Commission is charged with enforcing the Code of Practice which was framed by the newspaper and periodical industry and was ratified by the PCC in September 2009. As it is clear that there was extensive coverage in the British media regarding the McCann's success in achieving a temporary ban on "The Truth of the Lie"; it is also apparent that there is now a responsibility by these same organisations to inform the British public about the Lisbon Appeals Court ruling overturning the ban on "The Truth of the Lie". The following excerpts from the Code of Practice are, in my opinion, relevant to complaints regarding the silence in the British media regarding the Lisbon Appeals Court Ruling. It cannot be said that editors are unaware of the development as numerous complaints to the editors have already been lodged. .iii) Preventing the public from being misled by an action or statement of an individual or organisation.